Using shape is one way to simplify complex forms into more manageable information that we can use to build on to create that form. Looking for the large simple shapes in an object first, then working down to the smaller ones, we can find a starting point to build up the structures. I thought it would be a good exercise to show the process of drawing something with plenty of forms interlocking and texture on the surface. 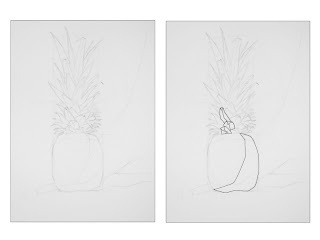 The drawing process below is only one approach to doing this. There are other ways to handle the same problems this form presents, but you may find this particular approach useful. How the process is broken down into steps is somewhat arbitrary, as well. We could combine steps to make less or separate steps into more. I want include as much information as possible without making this process seem overwhelming. My goal here is to provide one technique useful in dividing the information we see into steps that make seeing and drawing easier. 1. 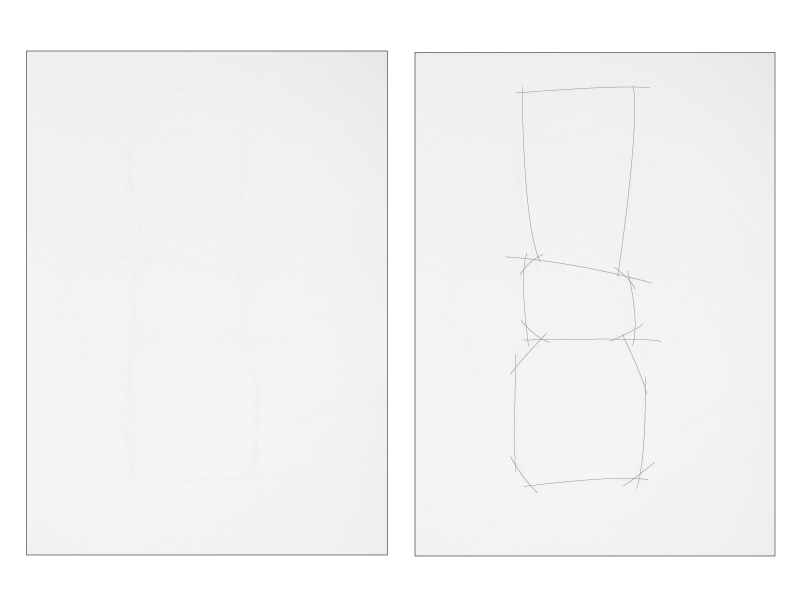 Draw the basic shapes. 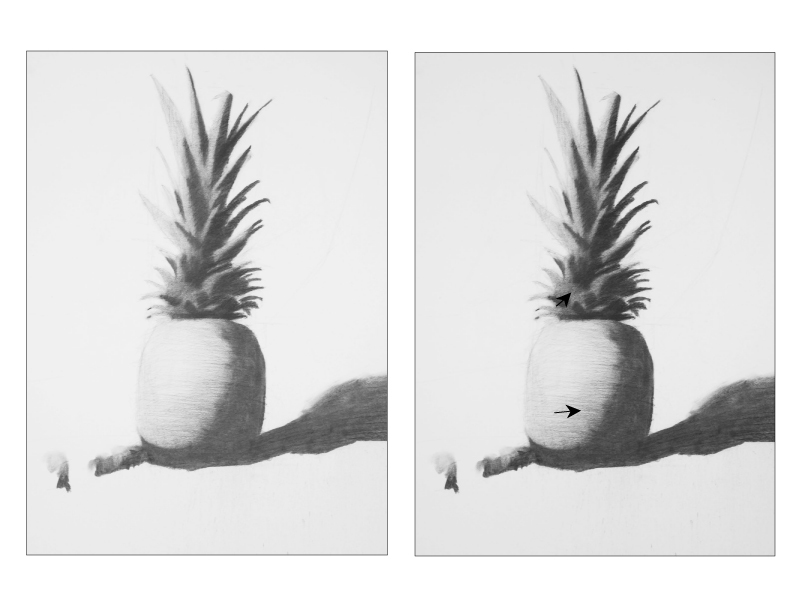 Look for the most basic shapes we can find in the pineapple. 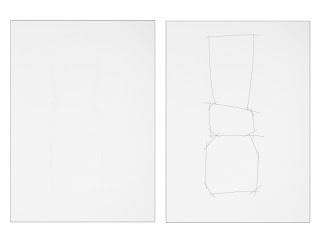 At this beginning stage we are only looking for the simplest two-dimensional shapes the form can be translated into. What we are looking to do is get the height and width relationship worked out. I am not worried about the contours of the pineapple just yet. 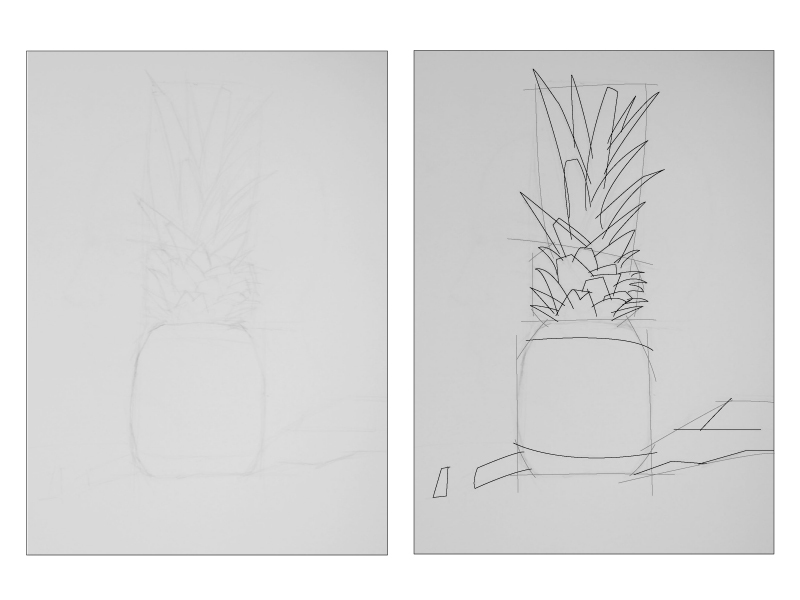 Working from the largest shapes I see in the forms of the pineapple to the smallest ones, I begin to refine the shapes by looking for the next size down I can find. We are abstracting a bit here as we are not copying the shapes in the form. Rather we look for the most basic shape elements we can find to divide the pineapple into masses that we can use as guides when drawing the smaller shapes. Think of it like carving. We are cutting the smaller shapes out of the larger ones. Using the new shapes we just created as a guide continue to look for and draw the smaller shapes. 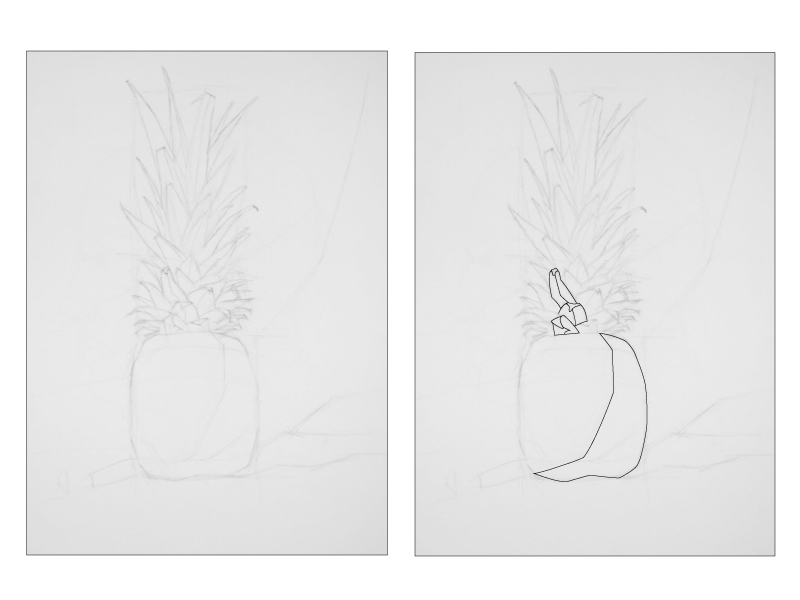 For the leaves of the fruit, I started at the base of the shape I drew representing the mass a group of leaves. This is just to give me a starting point to build on then move up. I am looking at the size and placement relationships between the shapes of the leaves and how they compare against the larger shape of the group. This helps me keep the leaves in proportion to the rest of the pineapple. 4. Separate the light side from the shadow side. Here we separate the light side from the shadow side. This is to prepare to shade. Everything is still just two-dimensional shapes at this point. Again, we evaluate the shapes make sure everything is where it belongs. 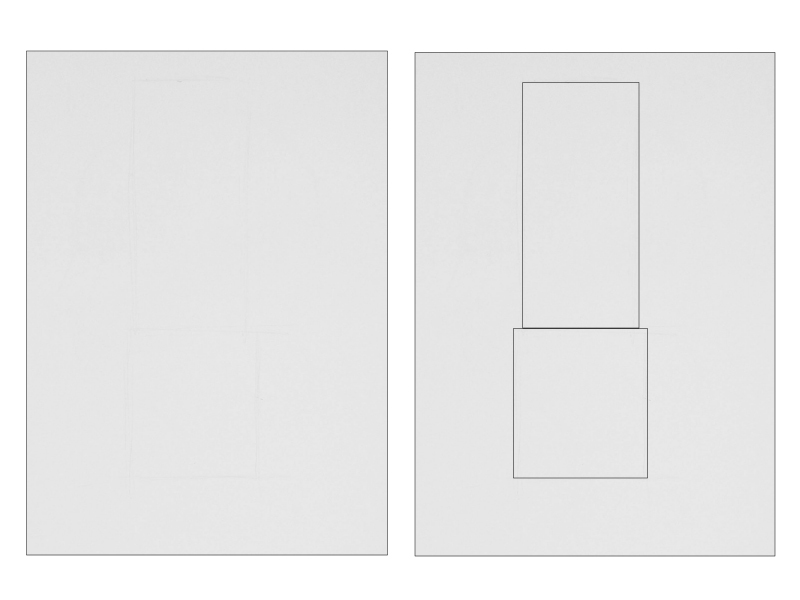 Ask yourself, does the size and placement of shapes look right. 5. Block in the value for the shadows. Now we can shade. In this step, we divide the image into two values, a light and a dark value. I used vine charcoal to shade in the shadow side. 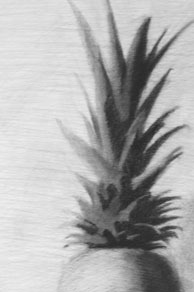 I like this because it lays down lightly and I can remove it more easily than compressed charcoal if I make a mistake. 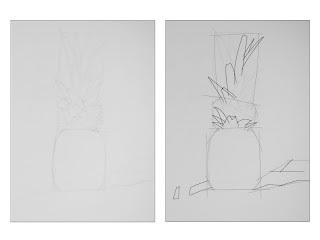 Here we can evaluate the drawing to determine if we need to correct any of the shapes before we start to draw the forms. Next we soften the edges of the shadows where appropriate. This is to give us a starting sense of the form shadows in the image. 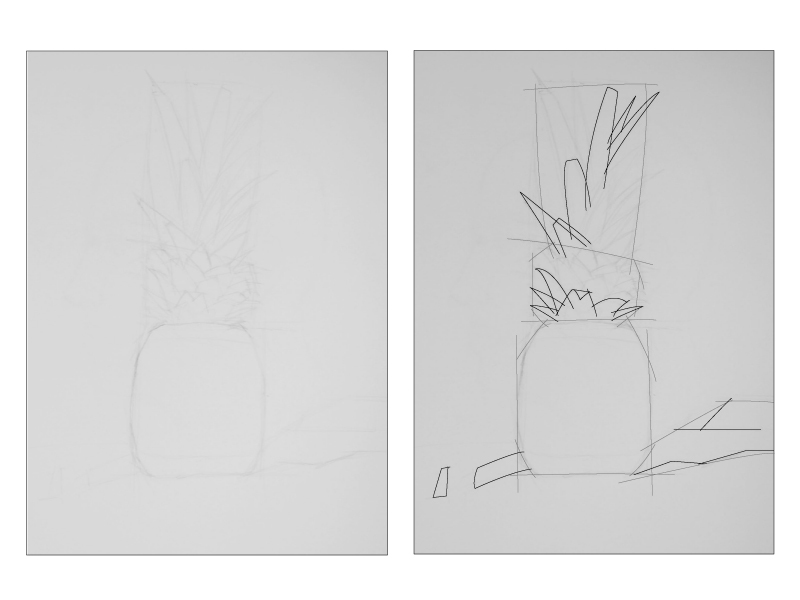 This step helps us with analyzing the transition from light to shadow on the forms. The edges of form shadows are soft in comparison to cast shadows. The more gradual the transition of the plane changes the softer the edge of that shadow will be. Next we draw the values of the mid-tone area in the light side of the forms. 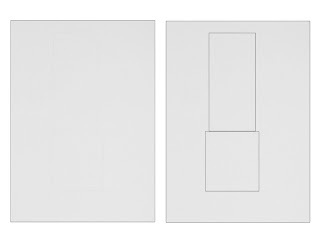 This connects the shapes of the shadow side and the light side together, creating a stronger sense of form. Here, I use a charcoal pencil to slowly build the shape. 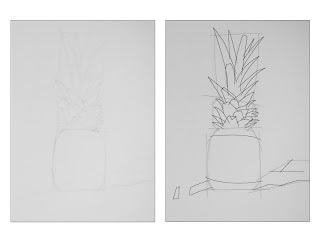 Another way to do it is to take the side of a piece of vine charcoal to shade in this area until the value matches that of the pineapple. We need to make sure to include an environment. This is important in helping create that sense of three dimensional form. For this example, I just shaded in the background and table surface. 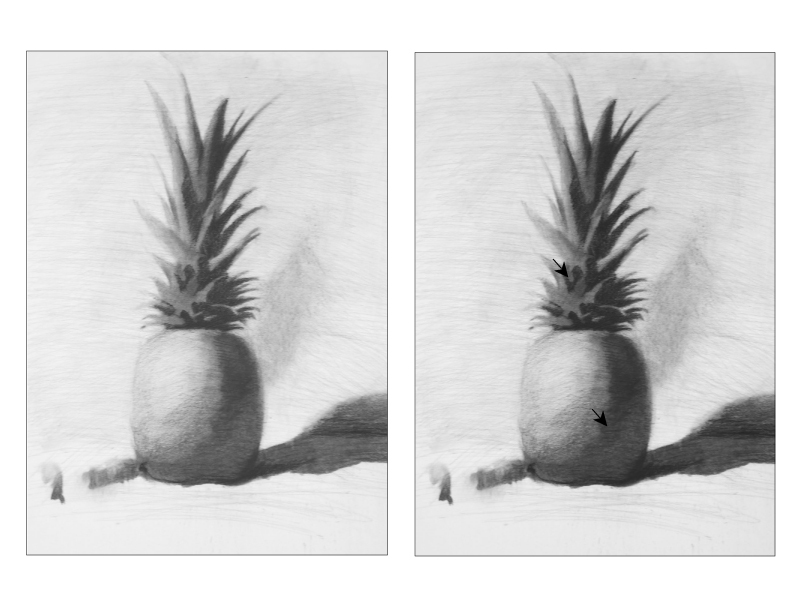 Now we can draw value changes that show the plane changes of the fruit. 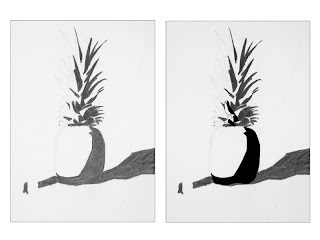 We can also include the core of the form shadow and make sure reflected light appears in the shadows. 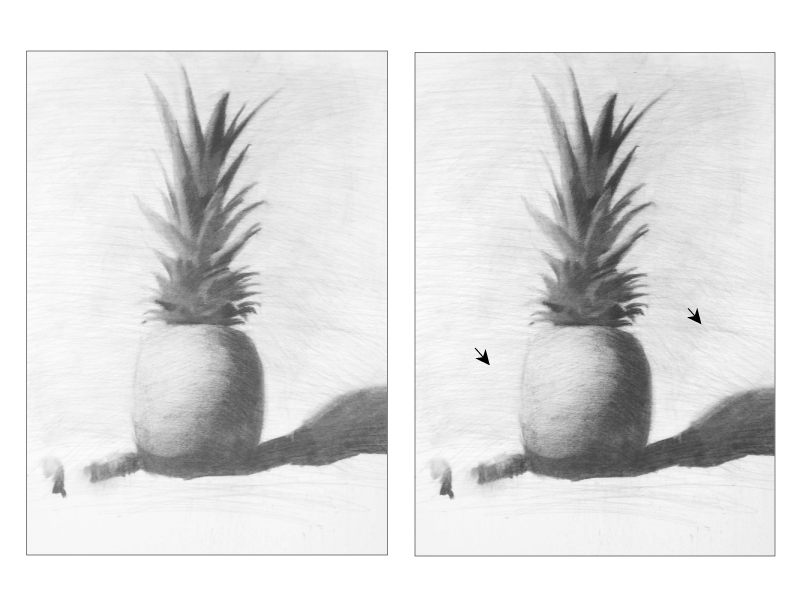 Notice how there isn't any information about the surface detail on the pineapple yet. In this particular process we are adding that last. The steps above are meant to get the three-dimensional form illustrated first. Then we can include surface detail. 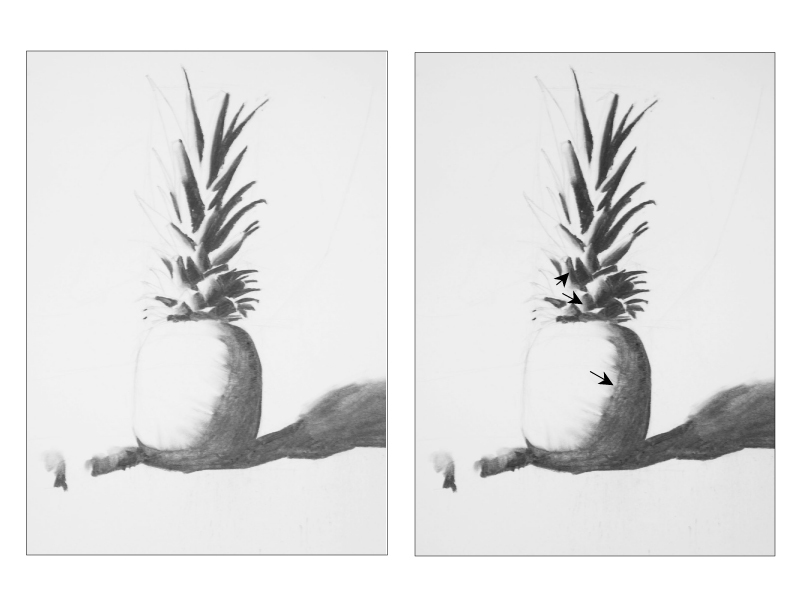 In part 2 we will lay down the texture and patterns created by the creases and notches on the surface of the pineapple. It is not up yet. I actually forgot about this one. I will get it posted soon. Sorry about that.